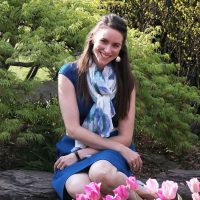 Suzanne’s philosophy is that life is always happening, and we must enjoy every moment rather than obsessing over perfection. What with a little toddler running around, alternately driving me crazy and delighting me, I totally relate to that. 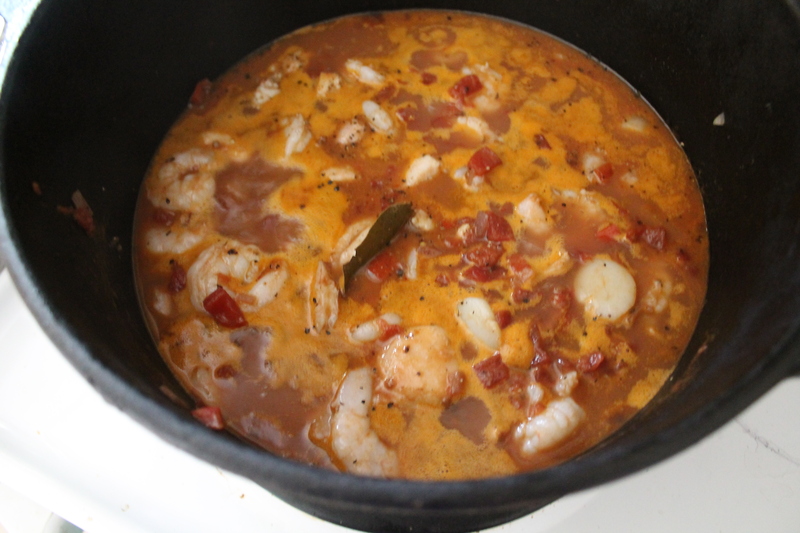 This soup even fits that philosophy: it comes together with fairly little effort (save debearding the mussels and deveining the shrimp…ick), so you have plenty of time while everything bubbles on the stove to chase after your kiddos or have a little dance party. Suzanne fell in love with this soup not in San Francisco, where it originates, but in Texas, home of big hair and fiery foods. She makes hers with a southwestern flair, but I veered back toward the slightly less spicy, given that it is hella hot and humid outside in June! So…we start with prepping the seafood. The grossest and most time-consuming task. I went to my local Asian market, my favorite place to buy seafood and cheap produce and I found pre-peeled but not deveined shrimp. Deveining shrimp isn’t my favorite, but at least I avoided all the shells and tiny legs! We also need to debeard the mussels, which sounds bizarre but basically just means yanking the scrubby part out of their mouths. Look for any little dangling strands and then pull as hard as you can toward the hinge of the shell. Huff Post has a great tutorial for mussels if you are still wary. 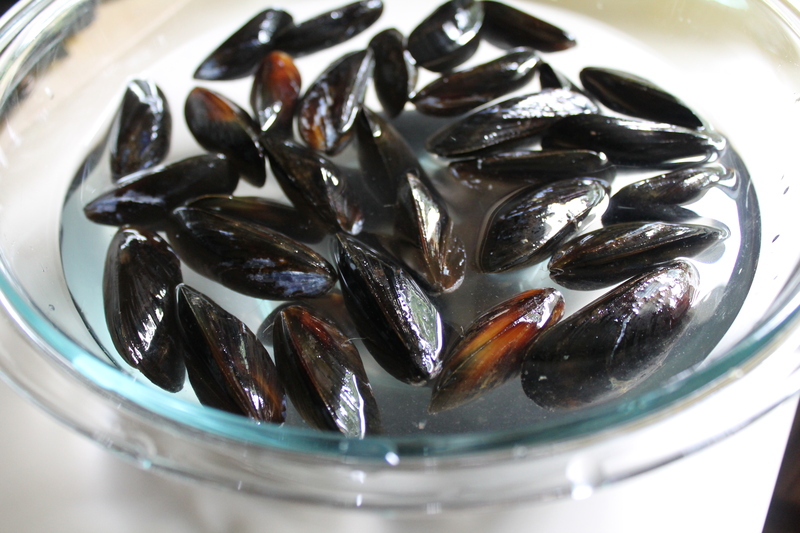 Drop all the mussels in a big bowl of cool water and let them relax. By the end of 20 minutes, the water should be a little gritty (some of your mussels may even be open still, just lounging in the water!). While the mussels are taking their bath, chop up the shallot and the bell pepper. I used a red bell because they were on sale at the Asian market, but you could go for any color you like! Heat some olive oil in a large pot or Dutch oven. 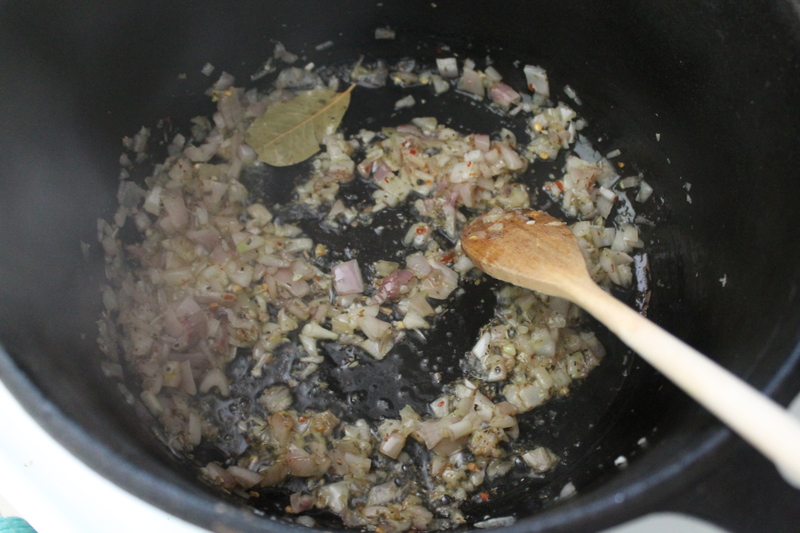 When it is warm, add the shallots, garlic, and dried herbs. Cook until the shallot is soft and translucent and the herbs are very fragrant. No need to stir constantly, just often enough that the garlic and herbs don’t burn! 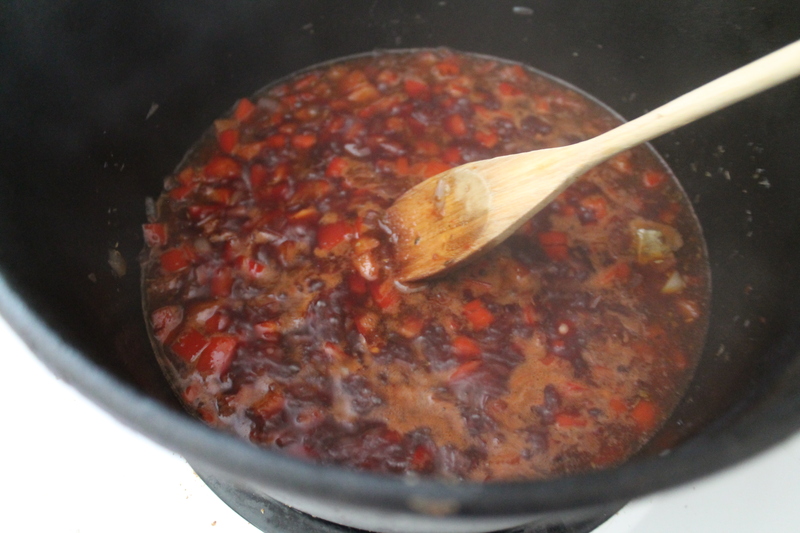 Add the bell pepper and tomato paste to the pot and cook another minute or so to get the raw bite off. Then pour in the wine and cook until it reduces by half, about 5 minutes. Stir in all the remaining liquids: tomatoes+juices (you could use fresh tomatoes if you are making this in late Summer! ), clam juice, lemon juice, and veggie broth. Cover and simmer for 30 minutes. Dance party! Sarah and I enjoyed this part almost as much as the meal we made! Taste your broth and season with additional salt and black pepper as needed. I really didn’t think it needed anything at this point, but I often like my food less salty than others. 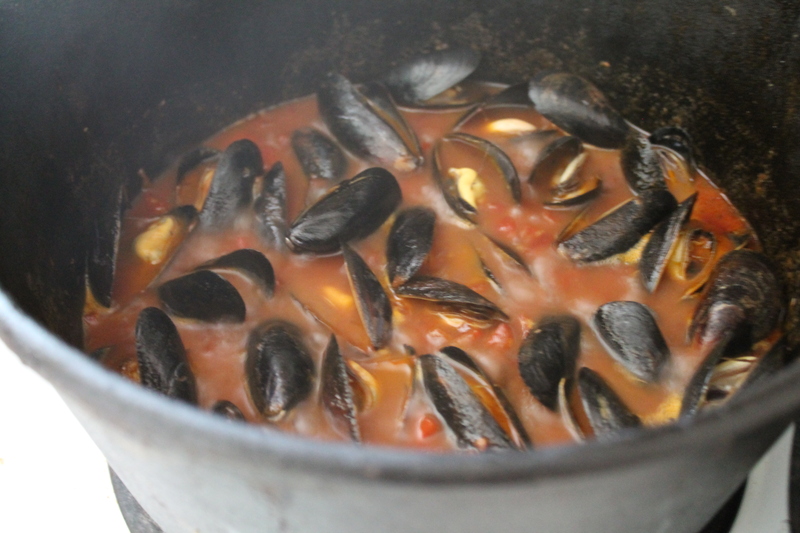 Then toss the mussels into the pot! Cover the pot and let them steam for 5 minutes. After 5 minutes, scoop out all of the open mussels. Cover the pot, and check the unopened mussels every minute, removing those that open up. After about 7 or 8 minutes of total steaming time, discard any of the mussels that are still closed, because they are dead. Sayonara. Now it’s time to cook the rest of the little swimmers. 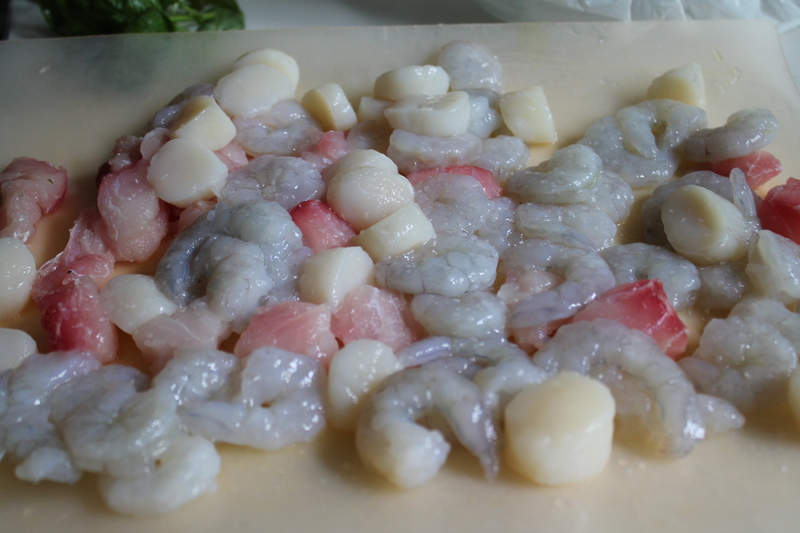 If you bought bay scallops, which are very big, you should cut them in half or in quarters. (I bought sea scallops, but I still cut them in half because I don’t prefer to have an entire mouthful of nothing but scallop.) Cut the fish fillet into evenly sized chunks–I used red snapper, but halibut would also be nice. Season the scallops, fish, and those deveined shrimp with a little salt and black pepper, then dump them into the pot to cook! They will only need 3–5 minutes to become firm and opaque. Overcooked shrimp and scallops are not delicious, so watch the pot closely and turn the heat way down when the seafood is cooked through! Add the mussels back into the pot, remove that bay leaf, and gently stir in some chopped fresh parsley and basil. And you’re done! Serve immediately with your favorite crusty bread…or maybe some rice! (wink wink, nudge nudge) Delicious! Heat olive oil in a heavy-bottomed pot over medium heat. When warm, add garlic, shallot, bay leaf, oregano, crushed red pepper, salt, and black pepper. Cook until shallot is softened, stirring regularly, about 5 minutes. Stir in diced bell pepper and tomato paste and cook, stirring, 1 minute. 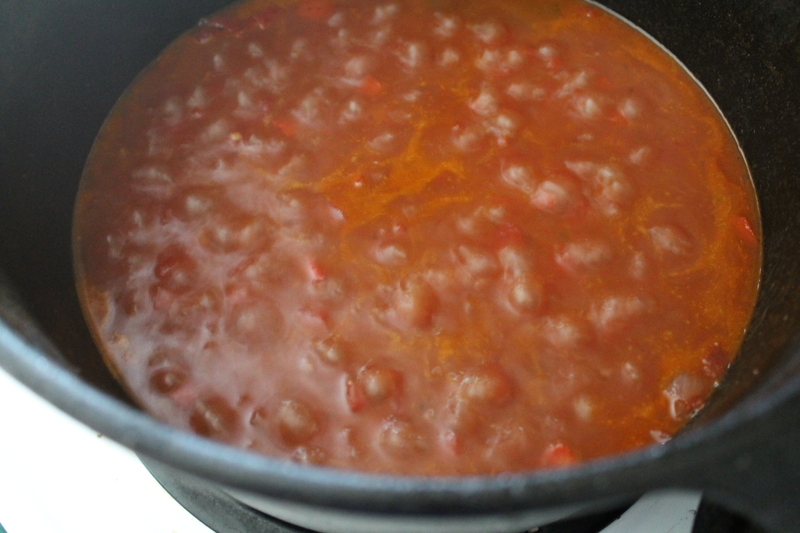 Add wine and boil until reduced by about half, 5–6 minutes. Add tomatoes with their juice, clam juice, lemon juice, and broth. Simmer, covered, 30 minutes. Taste and season as needed with salt and pepper. Meanwhile, debeard the mussels and soak them in cold water for at least 20 minutes. The mussels should open and release any grit or sand caught inside their mouths, though they may be completely closed again at the 20 minute mark. Lightly season fish pieces, shrimp, and scallops with salt and add to the stew. Simmer, covered, until just cooked through, about 5 minutes. Discard the bay leaf, then return the mussels to the pot and gently stir in parsley and basil. 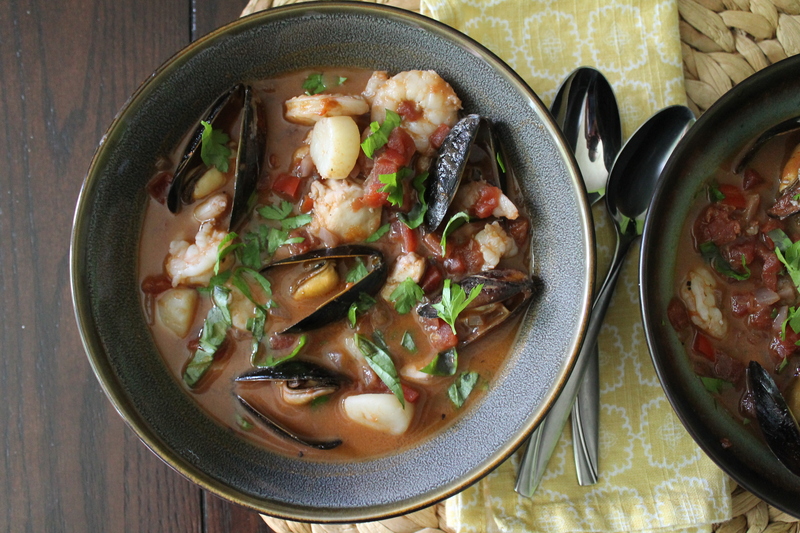 Serve cioppino immediately in large soup bowls, garnished with extra fresh herbs. I love cioppino but haven’t made it in ages. I can’t bring myself to add the mussels (just can’t eat them) but everything else is a go!! We havent made this in years – what a great choice! Oh that looks really good! I’ve never had cioppino before but I bet it’s delicious. I wonder if I could sub little neck clams instead of the mussels, since they’re not my favorite. I think the beauty of seafood soup is that you really can use whatever you like! A lot of cioppino recipes actually do call for clams instead of mussels (but I prefer mussels), so I think that substitution would be perfect! 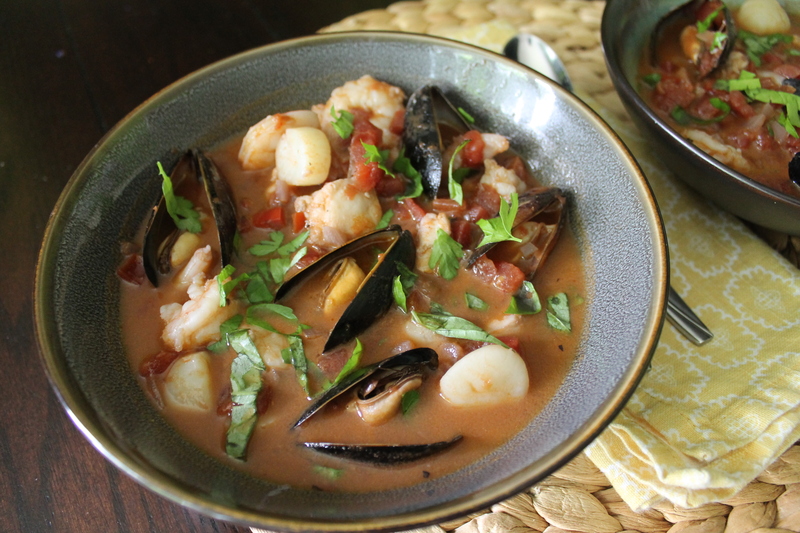 Your Cioppino looks fabulous! Thanks for sharing this recipe, it is a great choice for the SRC! Beautiful post. I had you this month and made your Camp Hanover Fudgies. (I also made your Lentil Chickpea salad and LOVED it, but I posted the fudgies). Thanks. WOW!!!! This looks perfect and makes me wish I had a great big hot stone bowl full of it right now! It’s raining and cooler than it has been (although not nearly cool enough for me). What a great job you did with this recipe and your post. You completely “get me” and I really appreciate the time and attention that you gave me and my blog. You ROCK!!!! Thanks so much! Oh wow – that looks like a restaurant dish – truly great choice and beautifully made! I love cioppino but have never made it. Bookmarking this to try! Visiting from SRC B. Finally posted about this, lol!